The damage occurs suddenly, usually during activities. 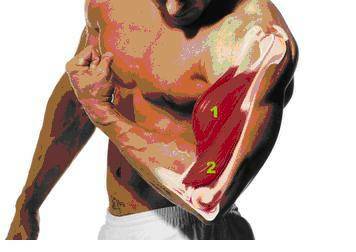 This muscle performs many movements: bending the shoulder joint, lifting the arm forward, bending the forearm. All these movements may occur simultaneously. The long head is also a depressor and stabilizer of the shoulder. Inclined downwards, two heads of the biceps brachii join into one belly transferring into a flat aponeurosis of the biceps muscle attaching to the nodule radius. Damage of the tendon of the long biceps head in a middle and older age is most often caused by developing degenerative changes and mainly concerns men. In young men, we usually have to deal with the biceps abruption. Tendon abruption usually occurs in the musculoskeletal part of the tendon. 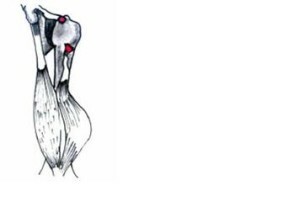 A characteristic symptom is shoulder pain combined with a simultaneous 'tearing' feeling. Recognition in the event of a tendon abruption is easy because the muscle shrinks and a typical muscle thickening develops. Forearm weakening is most visible. Elbow flexion is possible thanks to the action of the short head of the biceps. Treatment of complete muscle abruption requires an individual approach. Treatment varies and depends on the patient's age, location of injury, occupation. Older people usually do not have surgery. In the elderly and athletes, it is possible to use dietary supplements containing hyaluronic acid and chondroitin. Supplementation with these components is especially important in older people with degenerative arthritis changes and degenerative arthritis diseases and in traumatic and surgical patients. These compounds regenerate the articular cartilage, improve joint motion and relieve pain. The form of supplementation that is most assimilable for hyaluronic acid and chondroitin is drinkable liquid. Such form shows the highest absorption. In the case of young people and people training sports, surgical treatment is indicated for cosmetic reasons and because of the weakening of the muscle's bending strength and of forearm muscles. The proposed procedure is bipedal tenodesis and arthroscopic subcutaneous decompression. The rehabilitation plan after repair of total proximal tear of the long head of the tendon of the biceps muscle involves the use of immobilization with orthoses for 4 weeks, passive exercises, cautious active exercises supported in full range of movement and isometric exercises. Additionally, dietary supplements may be used rich in hyaluronic acid and chondroitin to improve the quality of articular cartilage and accelerate the regeneration of damaged tissues. After a period of 4 weeks, light exercise can be introduced and after 8 weeks after the procedure, an isotonic exercise program can be started, pressing on a bench, exercises a tape. In order to establish an individual set of exercises, you should visit a rehabilitation master.